When you can remember two ounces of a beer months after you’ve drunk it, it’s made an impression. If you can remember it even though you sampled it after two hours of drinking a lot of other beers, it really made an impression. That’s the case with the Imperial Porter from Zion's Ten Ninety Brewing, a monster 10.8% porter made with (are you ready?) pomegranate juice and cayenne pepper in addition to a monster grain bill. I first ran into it at last year’s Beer Under Glass, and even though remembering a conversation with owner Brian Schafer is a little hazy, the memory of the beer is perfectly clear. The Imperial Porter has been available on draft around town since the middle of last year, but only just made it to bottles last month, which is where I found mine. “We don’t make gimmick beers,” Schafer explains to me by phone from Big Chicago Brewing, where Ten Ninety contract brews its four core beers (its own facility is still being planned and seasonal beers will be coming soon). This may sound odd considering the avant-garde ingredients in this one but, believe it or not, there’s a level of restraint to this beer that you don’t find in many other beers with chile additions. "We wanted to make sure that you knew the heat was there…but not like a challenge beer,” Schafer saya. 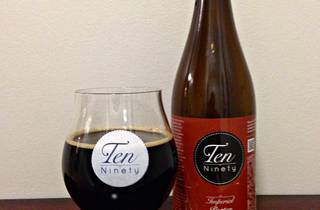 (Ten Ninety's Tabasco-barrel–aged Imperial Porter at this year’s Festival of Barrel Aged Beers, however, would certainly count as a challenge beer in my estimation.) “We wanted a balance. You don’t want to eat food that’s a crazy challenge.” The beer's inspiration came from a German Lindt chocolate bar flavored with pomegranate and chili—Schafer says he was “blown away” when he tried it. “On the second bite, I thought this could translate into a beer.” With big porter chocolate flavors, waves of fruit up front and spice lingering on the finish, he's made it happen. Surprisingly light-bodied for such a massive brew, the imperial porter pours a very deep near–black brown with a touch of maroon to it from the pomegranate juice. Very little head lingers around the rim of the liquid, and the aroma is full of fruity plums, figs, candy bar chocolate, a bit of walnut and a noticeable absence of coffee or roastiness. That continues through to the flavor. This is a beer in three acts: big, bold, sweet baker’s chocolate nibs right up front, which is quickly pushed aside by the sweet and slightly tart port-wine–esque flavor of the pomegranate juice, which enhances but doesn’t completely overpower. Schafer initially used pomegranate seeds in test batches but they didn’t add enough flavor; the pure juice gave it the heft needed to fight the cayenne. Just when you think that cayenne spice isn’t going to make much of an impact, you swallow and all the flavor of the beer washes off the palate, leaving nothing but a warm, just-aggressive-enough heat from the chili powder. It doesn’t burn; it just glows on your tongue, and then washes away on the next sip to start the process again. It walks right up to the line of “too much” but doesn’t cross it. 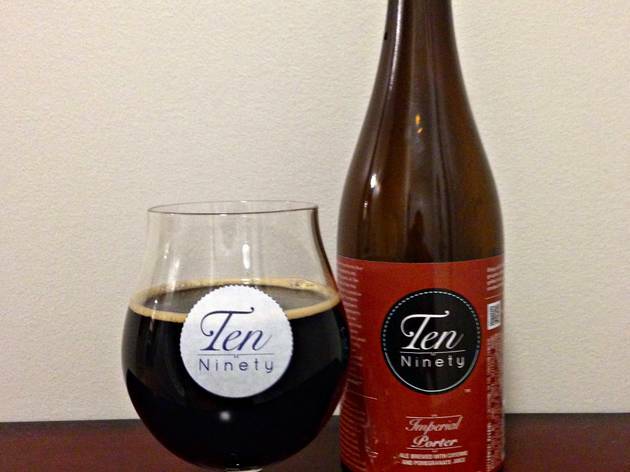 Ten Ninety is an all-imperial brewery, only creating beers that are 10% ABV and up. Also fittingly, its bottles only can be found in a 750ml size, just like wine. It wasn’t just a grape-and-grain parallel it wanted to make, however. “It’s a more elegant package [and] it brings more value to the consumer,” Schafer says. It looks good on a dinner table, too, and letting this open up and warm a bit is a good call. Find Ten Ninety’s beers on draft around Chicago. The Imperial Porter and Jaggery Triple are in bottles at Binny’s and other fine bottle stores.